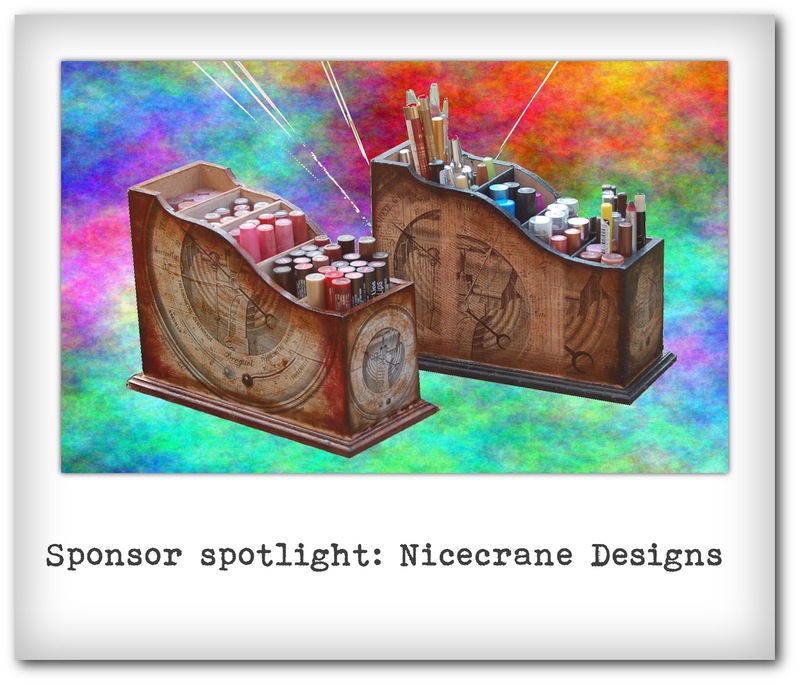 Did you know that you could go on over to Nicecrane Designs, a company with oodles upon caboodles of digital designs and choose your favourite, download it and use the image to do whatever you want with it? How cool is that? 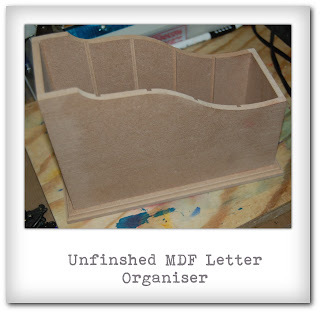 I am telling everyone that asks that these unique make-up organiser babies are designer pieces from the Nicecrane Design Collection! They look suitably impressed that I have "designer" home accents, and I reckon it might seem completely plausible that this might be the case ;) because these are among other unusual print decor items I have in the same design. 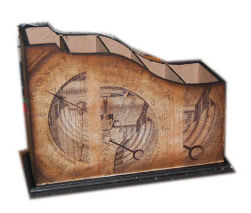 To be perfectly straight with you, I have never really thought about the potential of this option until I went on over to the site and the design penny dropped! 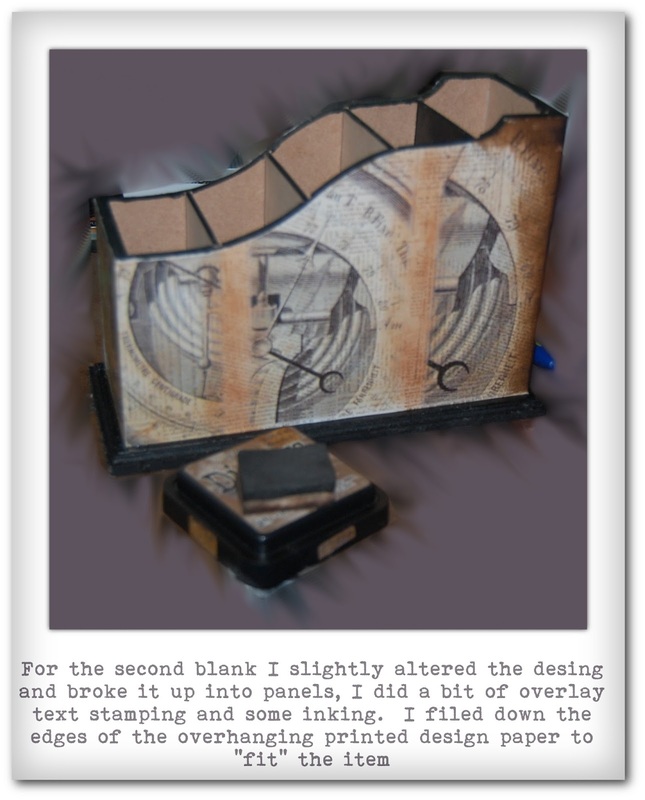 You could customise just about anything with your favourite design (for personal use only ofcourse). Let's think about this for a second. The accessories in your living room might need a bit of an update, you have been to the mall and scoured the decor shops looking for something you like, but nothing grabs your fancy or they might have the design print in one or two items like a cushion cover and a table runner, but that is all and you want the theme repeated on everything!!! You could even want that design hanging as art on your walls. 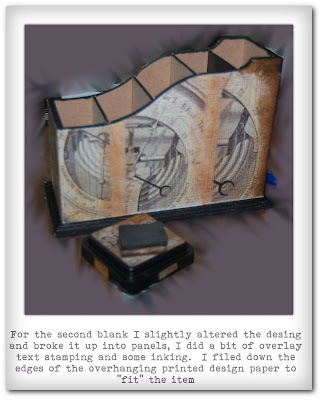 This I believe is the genius of buying a design off of Nicecrane Designs. All you would have to do is buy the image once, and then you could use the same image over and over in different applications. Technically you could makeover your entire room in the design of your choice. You could have the design printed on block canvas, you could transfer the design onto cushion covers, table runners, curtains, candles, guestbook covers, decoupage it onto trays and vases. Do you see? This is an amazing way to decorate on a budget. What I have decided to do is sort out my horde of make-up. 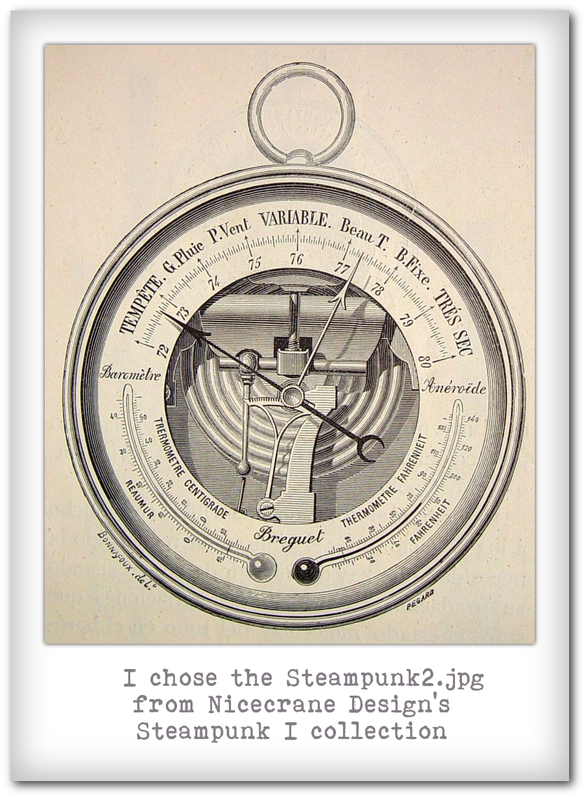 I needed something that would stay within the slightly steampunky vintage brown, black and cream theme I have going on in the room that I do my make-up in. I no longer felt okay about digging through the piles of lipstick, eyeliner, mascara etc in the big bucket I had it in. I wanted something a little more organised, in something cuter and in keeping with the theme. I am in the process of decoupaging every pot, holder, container in the same designer theme, including upholstery but I thought I would share with you one quick project that I made with one of the awesome Nicecrane Designs. So to begin with I went over there to choose a design - quite a task because the collections are amazing and it was hard making a choice. 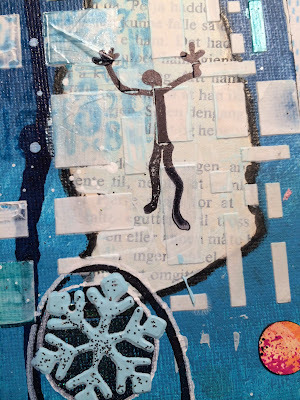 I smoothed out a layer of Dala Stencil Glue onto the unfinished blank. Dala Stencil Glue is my favourite glue because its super tacky, super strong and yet also simultaneously liquid enough to slide things on. It can also function as a repositionable glue - all in all, a really versatile all round glue. The last thing I did was to get out all my make-up supplies, arrange them in the way that I thought would be most efficient and voila we have designer decor accents that are actually functional. I seriously am in the process of having everything printed with this image. I made little boxes with this print to store my everyday blusher, Make-up remover wet-wipes , decoupaged around a coffee tin to store make-up brushes and hair brushes. I am in the process of transferring this print onto a canvas block for some wall art. I am going to transfer the print onto some cushions as well! I cant believe that it didnt strike me before to do a house make-over like this. Not only is it refreshing to have a new look going, but it is way more affordable and then there's added bonus of crafting everything yourself. Could living get any more fun? While I am still here - if you want to win a chance to do a home make-over like this - be sure to play along with OCC's Halloween Horror challenge this month. You stand to be in the draw for a $20 voucher to Nicecrane Designs just by entering your project into the monthly challenge. You could do over the whole house with $20!!!! Hi everyone! 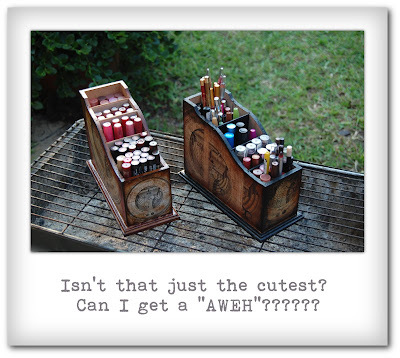 Laura here with our Guest designer for October...I have been so looking forward to this!!! I LOVE this designer! 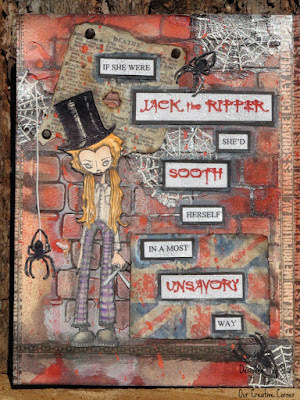 She is someone who has inspired me since I first arrived in crafty blog land and I love her work. 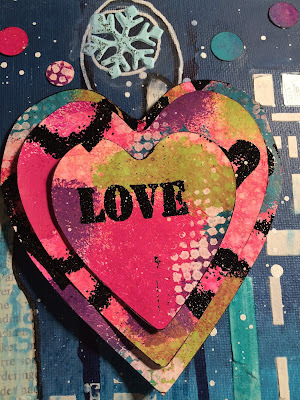 She is such a creative artist and her work is so wonderfully inspring - she does the most brilliant, informative step-by-step posts - with amazing detailed photos of her work (as you can see from today's post!) 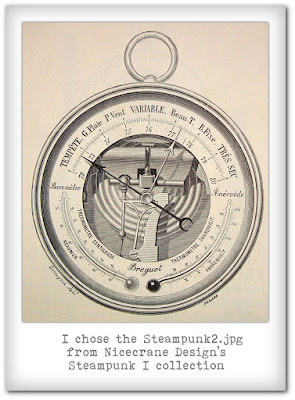 - so you really can never leave her posts without feeling so sparked with ideas galore! I everyone! 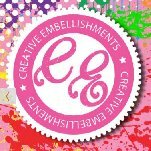 I am so happy to be a guest designer at Our Creative Corner. 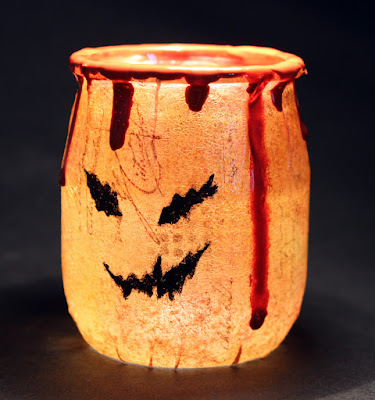 Halloween crafting is so much fun and today it is time for a spooky project. 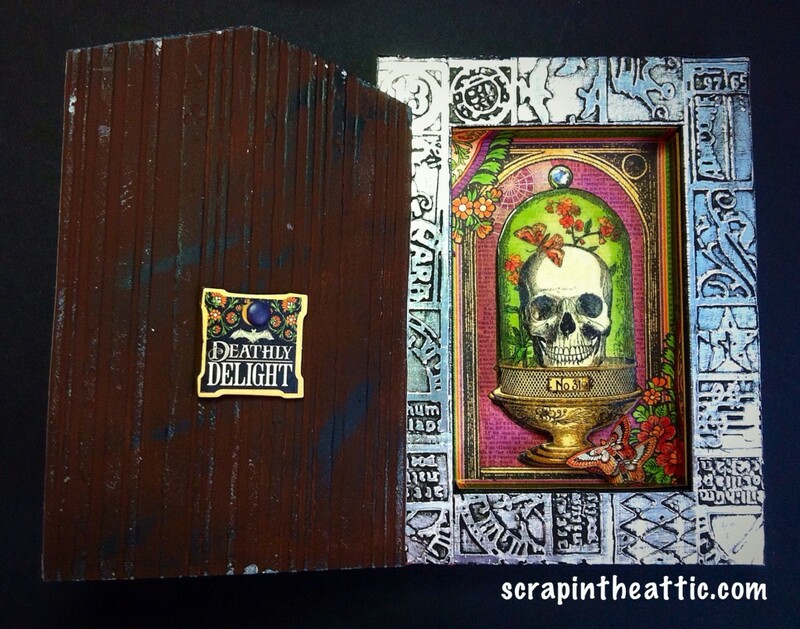 I thought Tim Holtz new Skull die would work well for a spooky project, especially with some added dimension and distress. There are a few spiders hiding on the skull too. The inky background is fun to do, and can easily be adapted to other types of projects if you use different inks, papers and stencils. I took a few step photos. 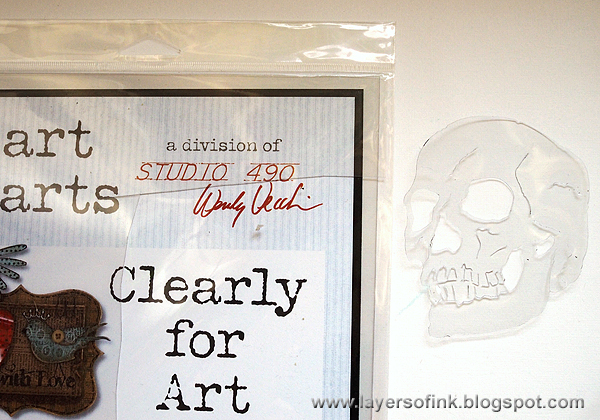 Start by die cutting the skull from Wendy Vecchi's Clearly For Art Modeling Film. 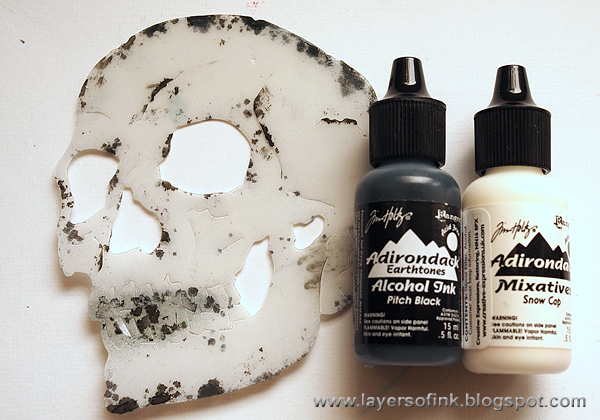 Colour the skull at the back using alcohol ink and an ink blending tool with a felt square. Start with Snow Cap Mixative - always shake the bottle first - and continue with Pitch Black. 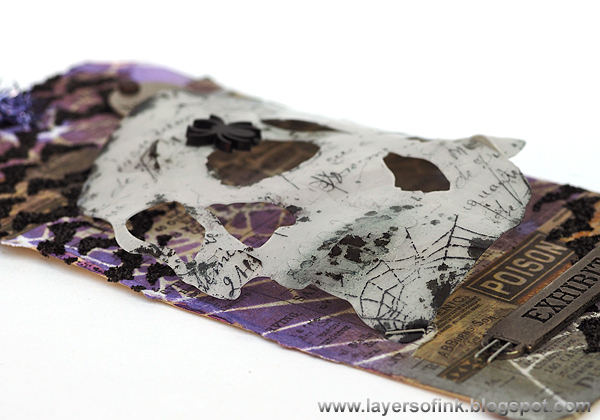 Stamp the skull on the front with various stamps and Stazon Jet Black. This both adds texture and makes it spookier. Heat the Modeling Film with a heat gun and shape the skull. Be careful not to burn yourself. You might need to work one section at a time, because the film cools down quickly. Once it is cool, it keeps its shape perfectly. If you are not happy with the result, simply heat again and reshape. 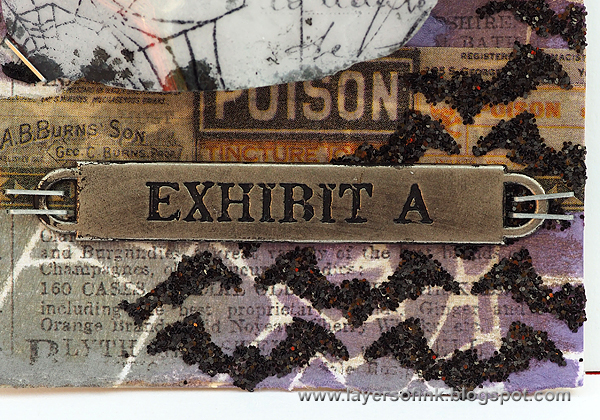 The tag was covered with Regions Beyond patterned paper and sanded. 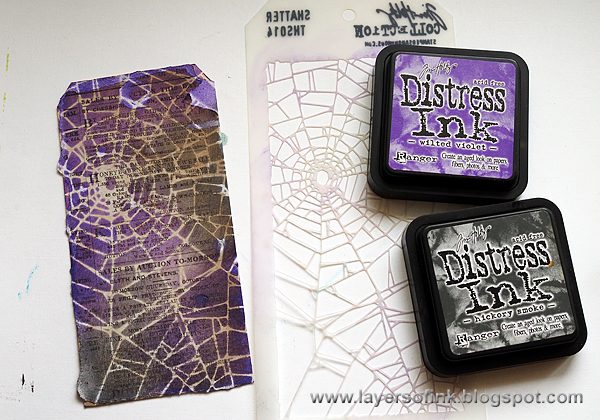 Place the Shatter stencil on top and ink with Wilted Violet and Hickory Smoke. I added some Regions Beyond Decorative tape to the background. 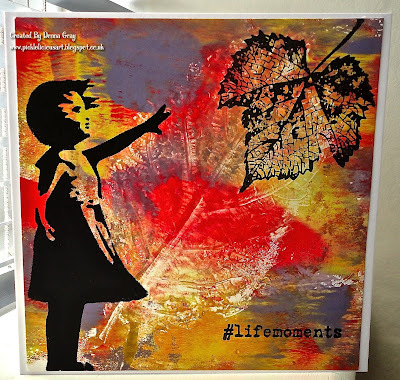 Place the Batground stencil over the background and apply Transparent Gloss Texture Paste through the stencil with a palette knife. Pour Black Soot Distress Glitter on top. Set aside to dry. 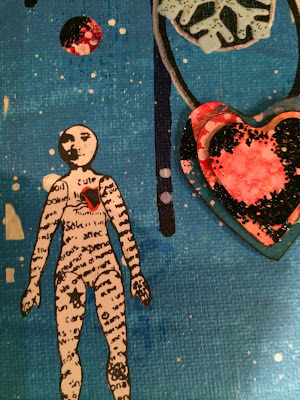 I attached an Oddities Adornments token with a brad. I also added a spider from the Wicked Alpha Parts set to the skull. Attach the skull to the tag with tiny staples. 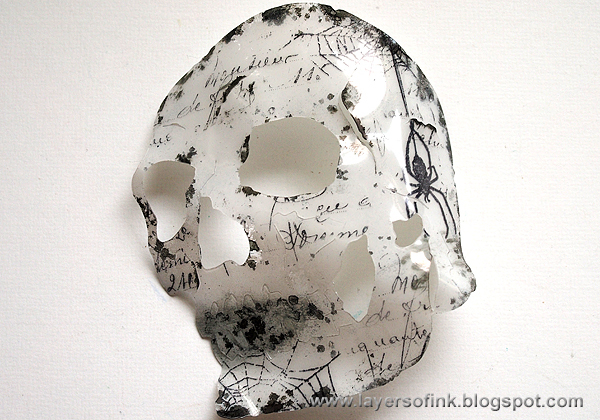 The dimension, alcohol ink and stamping makes the skull pretty spooky. Staple a Word Band to the bottom of the tag and you are done. Here you can see the dimension of the Modeling Film a little better. I hope you enjoyed this post! 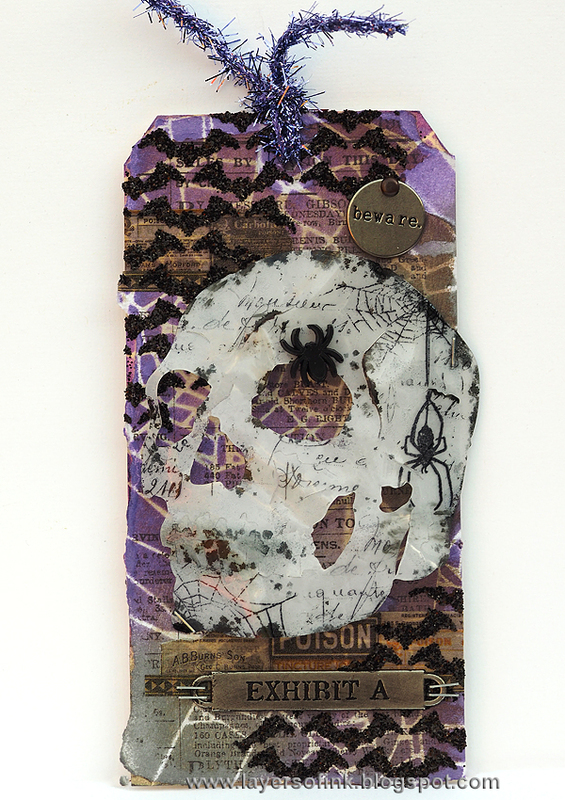 I had fun making a spooky project for this guest post for Our Creative Corner. 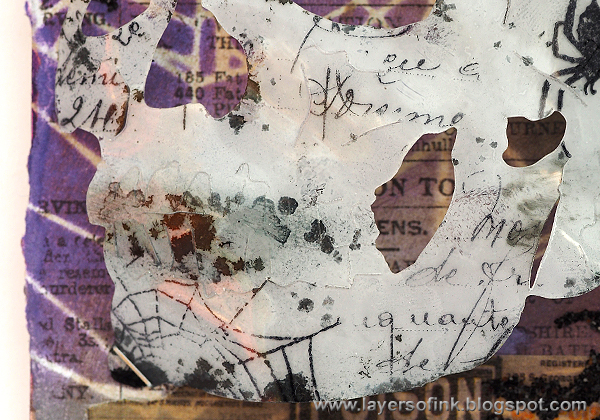 You can always visit my blog Layers of ink, for more inspiration. WOW!!!! Anna-Karin...words truly fail me....Thank you so much for joining us here today - You have done exactly what I knew you would - knock our socks off! Remember the challenge continues until 28th October...Get those scary creations posted to be in with a chance to be a winner! Hi and servus! Claudia here to bring to you another (hopefully inspiring) tutorial. I know it's been quite some time since my last post over here as the RGD (Resident Guest Designer) - due to my usual creative silly season. But once it gets colder and darker outside the cosier and more comfy it gets inside the house - and then spending time at my crafting desk (with a warm cup of tea and all of my paints, dies, stamps and mixed media supplies around me) is what feels right and good again. 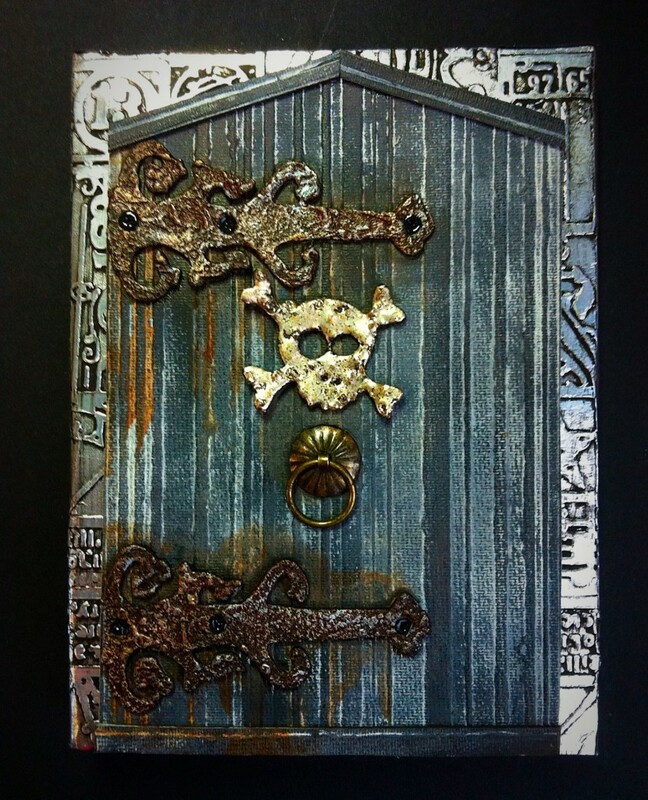 I created this art journal page using some of my all time favourite Tim Holtz dies (the On the Edge "Graveyard" and the "Rickety House" Alterations die) and my new favourite Dreamweavers forest stencil and combining it with some hand drawn images. 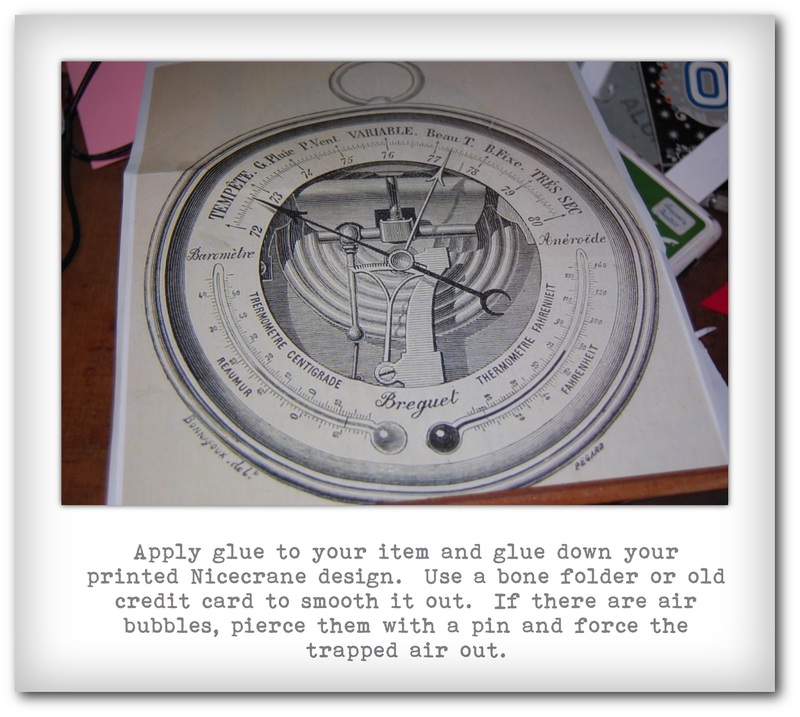 I always keep the acetate packaging the Sizzix dies come in for later use. This time I die cut my own reusable stencils and masks from it to combine with other stencils to create some scenic backgrounds for my illustrations. I just love this cute little graveyard and the mask I made with it! I decided I wanted to use it together with the forest stencil in one go and fixed both to my journal with masking tape, making sure both were in place. 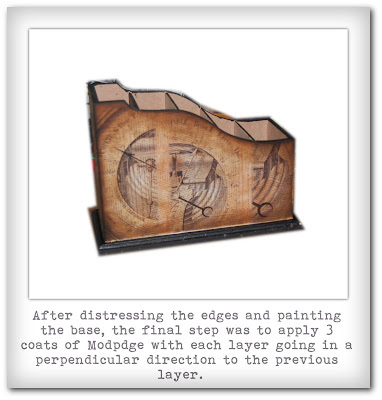 The page's background had previously been given a coat of rough wide brush strokes in dark grey and black acrylic paint. Now - with my masks in place - I stippled on some Medium White, Beige and Orange with a stipple brush, making sure the paint wasn't too liquid and the brush was dry. ...and then stippling in the yellow-ish lit windows (using the house mask) and their shine thrown upon the ground in front of the house (you will find that I redid this once I had finished my trick'n treatin' children's drawing as I wanted their shades to be in a specific spot and angle on the page). You can also see that I had to go in again with the Dreamweavers stencil and redo the bit of forest that was now covered from creating the dark background for the house (the spot at the veranda). The owl was first stamped on, painted over with beige and black where needed (to cover up the branches that showed through) and then I hand drew in the feathers and face using a black permanent fine tip Faber Castell PITT artist pen. Once I had found the proper spot for my drawing I glued it on with matte medium and then painted some shades of the green-yellow colour from the window lights and some orange shades (from the sun shining through the fog behind the trees) around the children's shapes to blend them in and make them part of the whole scenery. The drawing was done freehand - after doing a rough sketch with a soft pencil first - with the fine tip black Faber Castell PITT artist pen. I didn't worry too much about them maybe looking awkward - with Halloween projects this may well add to the spooky impression, right? But here they are - obviously a bit scared of the house and still deciding whether to ring the bell and shout their "trick or treat!" or not. 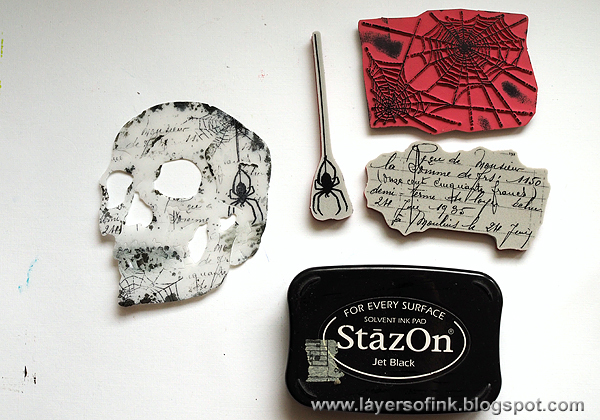 I hope you like my little Halloween scene and what I did with my selfmade masks and stencils! Good morning everyone. 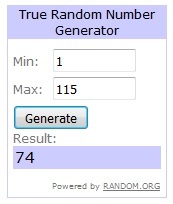 Julia here to announce the winner and top 3 for my Shades Of Autumn challenge. Wow! We were really pleased to see so many of you playing along last month - an absolute shower of beautiful autumnal goodness! That made the task of choosing an outright winner and top 3 very difficult indeed and I spent a great deal of time going backwards and forwards between posts. Without further ado, let's get down to announcing the winners shall we? Congratulations Kathy Jo! Have fun shopping! We'll be in contact with you shortly. I loved the stark Banksy image against the beautiful autumnal background so much. This reminds of those autumn days when your hair blows around, the leaves swirl around you and the glorious colours of autumn are everywhere. 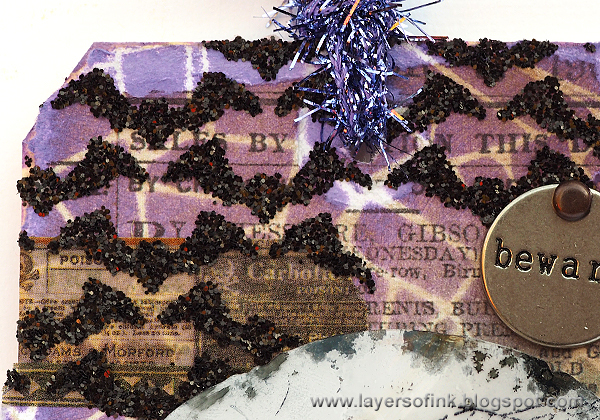 The clever use of a real leaf on a gelli plate print for the background sealed the deal for me! Thank you Donna for sharing your art with us. 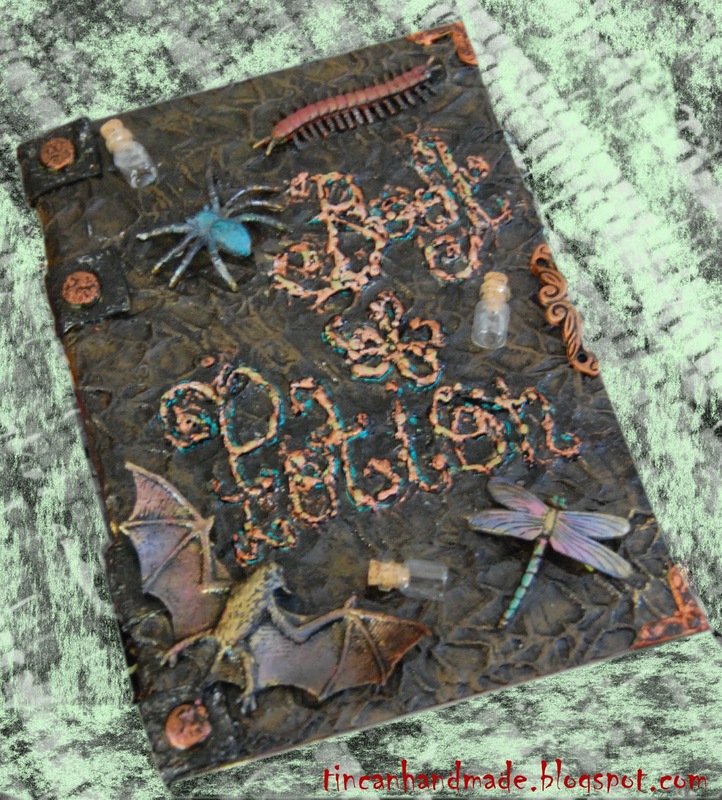 I loved the swirling leaves on this beautiful journal spread from Evelyn. When you look at the enlarged images, you see just how much texture and layering has taken place to achieve this gorgeous spread. 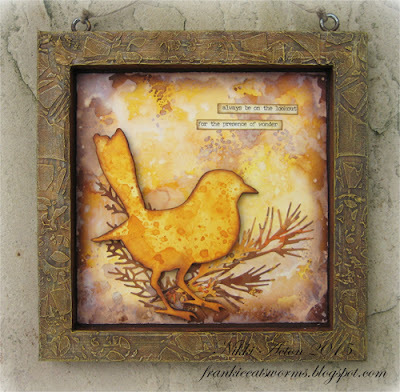 A gorgeous reverse canvas from Nikki which has that beautifully textured frame along with the bird in all his autumnal glory. Stunning! 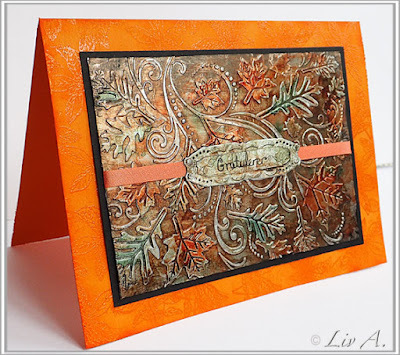 I really love the rich autumnal shades on the embossed panel and the word band. If you click on the image you see the beautiful leaf background on the base card too. Wonderfully rich, warm colours. Ladies, your badges will be with in a short while - we hope you display them with pride on your blog. Aren't these just beautiful projects? Thank you to all our winners and to everyone who made my challenge such a special event. Don't forget that Laura's challenge is live until October 28th 11.55pm. The theme is Halloween Horror and you can find all the details here. We had so many entries for last months 'Shades of Autumn' challenge - Thanks so much to all who took part - Julia will be here in the 4th with her winners post! Don't miss it! Nicecrane Designs are kindly offering a very generous $20 voucher to spend at the store! And what do we want you to make this month? are sure to send shivers down our spines. 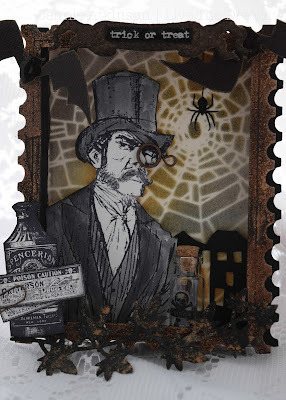 ....or perhaps take on the challenge of finding a way to transform pretty stamps into something macabre. Let's see what my talented team made to inspire you this month! A very gaudy pink mirror decoration....made into grungy horror! but in a strange way, don't you feel? so my project this month isn't a 'traditional' horror filled one! 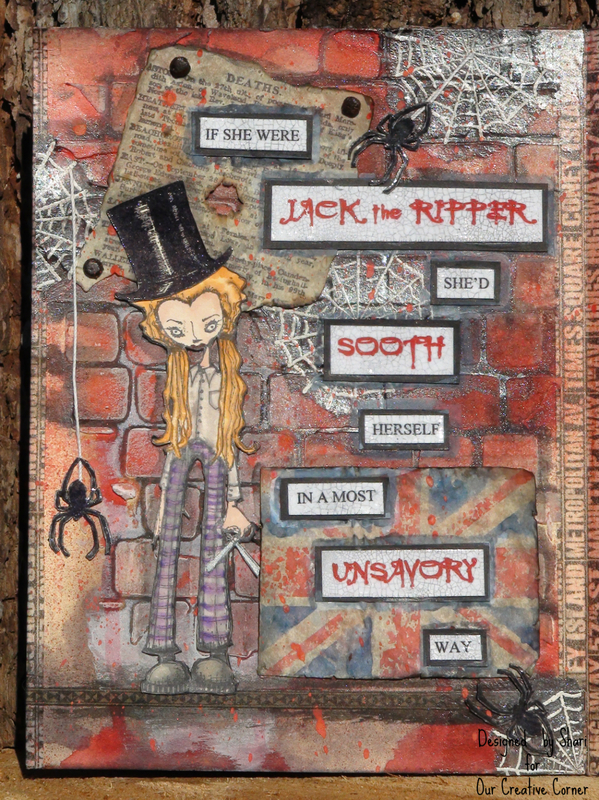 and you've got my art journal page to darkly celebrate the season of horror. My idea was to make a little wooden frame with humor. She says, I will call you - yes, my one and only love - I will wait. that's horror , or ??? I used my scary craft to turn a regular notebook into a scary ol' "book of potion"
until you can cast a spell to unlock its scary secrets! OPEN THE DOOR......if you dare! 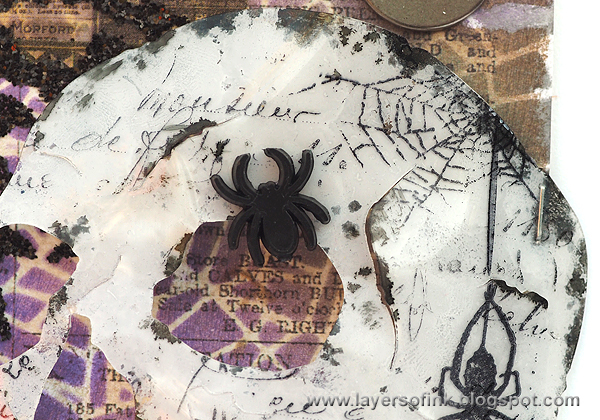 I made two little cards, with spooky skull and spiders…scary, isn’t it? I needed no encouragement to join Laura on the dark side!
. . . . . . . scared yet? WOW!!! amazing creations! I am sure you can find some 'Horror' Inspiration here! You could be our Winner of the challenge and be invited to join us as our Top Talent! You could be one of our Top 3! So many reasons to join in some spooky fun!